(Maggie Valley NC) Midnight Hole is a deep and scenic pool below a 6 foot waterfall. The pool the falls are part of the Big Creek section of the Great Smoky Mountains National Park. 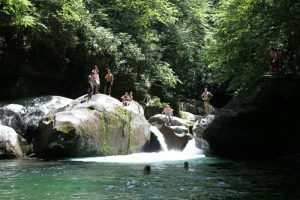 Midnight hole is a popular swimming destination for adults, teens and families in he Great Smoky Mountains National Park near Maggie Valley NC. There are a number of large rocks around the pool, and due to it’s depth, jumping from the rocks into the pool is a very popular activity for the younger crowd. We went on Tuesday, July 9th and arrived around 1:00pm with our 6 kids and two additional teens that were friends of our teens. Midnight hole was pretty busy that day, with lots of families, teens and adults. 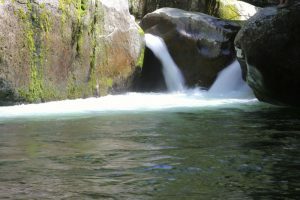 Adults, teens and children were basking on the rocks in the sun, wading in the shallow water below the falls, and of course jumping from the rocks into the pool below the falls. Overall there was probably about 50 people there that day, much more than usual. People of all ages were there. We saw a few senior citizens just watching all the activity from the shore or while cooling off in the shallows. A number of younger children, probably 5 – 9 were enjoying the shallow water while the pre-teens and teens hung out on the larger rocks near the falls and jumped into the water. One of our sons taking the big plunge into the water. Most of the adults were wading in the water, keeping an eye on their kids, but a few were jumping as well. 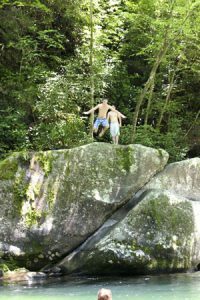 Our older teens spent most of their time jumping from the rocks. The picture to the left is of my 18 year old and his friend, jumping from the tallest rock. The water was pretty cold, but very refreshing, especially after the 1.5 mile hike in. We stayed for about 3 hours, and our kids (and us) had a blast. Just sitting on the rocks listening to the sounds of kids playing and the rush of the waterfall in the background was pure bliss. We loving taking pictures, and I ended up shooting over 100 pictures that day. The ones included here are just a few of the better pictures I took that day. I really didn’t want to leave. I’m really looking forward to hiking up during the fall, and getting some fall shots, which should be gorgeous. Midnight hole is on the Big Creek Trail in the Great Smoky Mountain national park. Fortunately for us, it’s only about a 20-30 minute drive. To get to the trailhead, Take I-40 to the Waterville Road Exit (#451). Turn left after crossing the Pigeon River and proceed 2.3 miles to an intersection. Continue straight through, pass the ranger station, and you’ll arrive at a large parking area at the road’s end. The road into the park is a dirt/gravel road. I can be a bit rough, but passable by any type of vehicle. Just go slow and watch out for the pot holes. Just before you enter the parking lot, you’ll see the Big Creek trail head to your right. 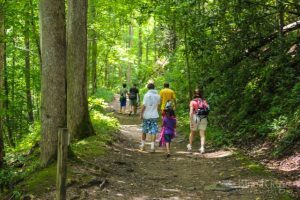 From the parking lot, follow Big Creek trail for about 1.4 miles. Midnight hole will be on your your left. You can’t miss it, as you’ll either hear the people swimming or hear the falls. Next to the parking lot is a really nice picnic area next to Big Creek. This is a great place for families with younger children, as the water is a great depth for wading and splashing. Midnight hole has more shallow areas as well, but not many. Most of the water areas in Midnight Hole are a 1 -2 feet, minimum and the current is fairly strong, so small children should be watched closely. Our 7 year old daughter, who is small for her age, had no problems wading around in the shallows. Big Creek Trail is an old railroad grade that was used to haul timber and lumber during the logging boom, prior to the area becoming Great Smoky Mountain National Park. Horses are allowed on the trail, and while we haven’t seen any the times we’ve been there, I would recommend watching where you step, just in case! Big Creek Trail is a relatively easy hike with a moderate incline walking to Midnight Hole. The trail is really pretty and you’ll see and hear the wonderful sounds of Big Creek while walking. The trail does get pretty steep to one side, so be careful. We held our daughter’s hand during this part, just to be safe. The walk is nice and shady the whole time, making for a cool walk. You’ll likely encounte r lots of people and families walking on the trail, either going to or coming back from the falls. You’ll know you’re close to Midnight Hole when you cross the wooden bridge. To get to the falls/swimming area, just walk down the narrow path to the left. The trail is a bit rocky, so young children will probably need some help. If you hike up the trail another 1/2 mile, you’ll come to Mouse Creek Falls. The falls are 41 foot high, and just beautiful to see and take pictures of. We didn’t make it that far, but definitely plan to pay it a visit when the leaves begin to turn. If you’re looking for a nice family hike, with a wonderful reward at the end, I’d definitely recommend Big Creek Trail and Midnight Hole. The area is gorgeous, the water clean, cool and refreshing. Adults will enjoy the scenery, sounds and water. Kids will enjoy the water and all the water action. 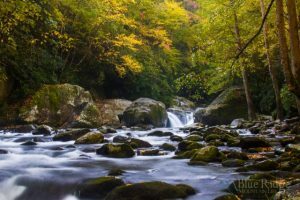 Midnight Hole should definitely be on your list to visit when coming to Western NC mountains and the Great Smoky Mountain National Park.